Those of you who pay attention to such things will probably be aware that most of our gospel readings this year come from the Gospel according to Mark, but that for the past few weeks they have come from the Gospel according to John. Sometimes you will hear people object that the three year cycle of Bible readings that we follow, known as the Revised Common Lectionary, gives a year each to Matthew, Mark and Luke, and that therefore the fourth one, John, gets pushed out. If this were true, it would indeed be a concern, because the other three are much more similar to each other, and so John is hardly the one you would want to leave out. Fortunately though, it is not true. John’s gospel gets just as much attention in the lectionary as the other three, but it is spread out across all three years, precisely because it is so different from the other three. And because Mark is the shortest of the gospels, we get even more of John this year than in the other two years. One of the really different things about John’s gospel is that there is no account of Jesus sharing bread and wine with his followers at the last supper, but instead there is this amazing reflection in chapter 6 following directly on from the story of the feeding of the 5000 in the desert, about Jesus as the bread of life, and about sharing in the body and blood of Christ. The section is so rich, and at times so shocking, that it is difficult to know where to start as a preacher, but at least it is spread over five weeks, so I can have several goes at it if I need to. The most shocking element of it is that the imagery that Jesus uses is literally cannibalistic. We heard Jesus conclude tonight’s section by saying, “Whoever eats of this bread will live forever; and the bread that I will give for the life of the world is my flesh.” We can’t easily escape the gruesome cannibalistic overtones of that, and I don’t think we are supposed to, but that imagery is developed even more fully in next week’s extract, so I’m going to put off tackling it until then. 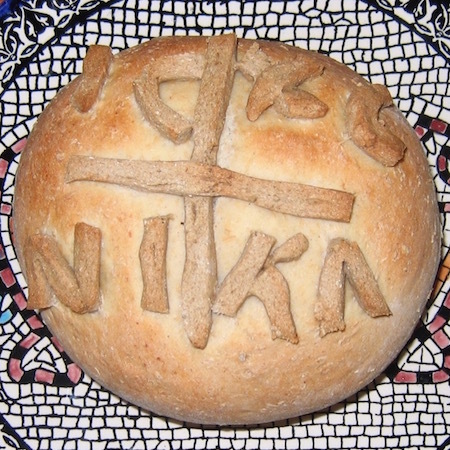 Tonight instead, I want to look at something of what Jesus means when he says, “I am the bread of life. Whoever comes to me will never be hungry, and whoever believes in me will never be thirsty,” and I’m going to take some of what we heard from the letter to the Ephesians to help illustrate what that might be about. At first glance you might want to suggest that Jesus is using some classic advertising-speak here; something straight out of Marketing 101. The first thing any advertiser knows is that everyone has a feeling that something is missing, that there is something more they need that will bring lasting satisfaction, but that most people don’t have any real sense of what it might be. And therefore if you are marketing a product, and you can give the impression that your product might be the missing thing that will finally fill that hole and bring lasting satisfaction, then you’ve hit pay-dirt and you can be sure of good sales. Analyse the ads on TV any night of the week and you’ll see that same message coming through time after time. So when Jesus says, “Eat this bread and you’ll never be hungry again,” it does sound a lot like classic advertising spin. But if it is supposed to be advertising spin, Jesus gets it all wrong from here on because, as we will hear in two weeks time, by the time he’s finished, pretty much everyone reckons that what he is offering is completely unpalatable and they are leaving in droves. And when he asks his disciples whether they want to give up on him and leave too, their answer gives the impression that they probably would if they hadn’t already burned most of their bridges and had nowhere left to go. Marketing or not, one thing Jesus is clearly doing is contrasting two different things and calling us to choose between them. “Your ancestors ate the manna in the wilderness, and they died. I am the bread that comes down from heaven, so that one may eat of it and not die.” As God had said to the people through Moses, centuries before, “I put before you life and death; therefore choose life.” We might say here that Jesus is talking about the bread of life and the bread of death; therefore choose the bread of life. In other words, what they are objecting to is the idea that the gift of life in God might be made known in an ordinary human being, someone whose origins are no different to ours. Because if it is someone ordinary, why him and not one of us? And the first thing I want you to note from this is how Jesus answers, because he quotes scripture, but not in a way that argues that he is unique and different from everyone else. He quotes a line from the prophets that says, “And they shall all be taught by God,” and then he says that everyone who has heard and learned from the Father gets this. So in fact he is suggesting that it could just as easily have been any of them; that God’s ways and God’s gifts can be made known in anyone who embraces them and lives them and shares them. Again we have this image of two different ways that we are called to choose between. Or could we say two different breads that we can choose to eat? On the one hand there is the bread of bitterness and wrath and anger and wrangling and slander and malice, and on the other hand there is the bread of kindness, compassion, forgiveness and love. And in the words of the Apostle, “therefore choose life” becomes “therefore be imitators of God” by choosing the bread of kindness, compassion, forgiveness and love. Each week, as we break the bread at this table, we pray with some words from St Augustine, “Let us receive what we are; let us become what we receive.” This image of becoming what we receive is, at one level, simply basic biology. We are what we eat. What we feed on becomes a part of us. And Jesus works with this image as he calls us to feed on the bread of life, to feed on him. Receive what you are. Become what you receive. Will you become people of bitterness and wrath and anger and wrangling and slander and malice, or people of kindness, compassion, forgiveness and love? It all depends what you feed on. The options are laid before you. And the difficulty for many people is that both can look like they are from God. If you have been fed on images of God as angry and full of wrath and fairly bursting to vent his anger in a fiery punishment of sinners, then being people of bitterness and anger and wrath can easily be dressed up in spiritual language and made to sound like it is simply a fierce loyalty to the righteousness of God. If that’s your God, then “be imitators of God” could very quickly lead down that path. This is exactly why Jesus makes such a bold claim about himself. “I am the bread of life.” It is also why the Apostle so explicitly links “imitating God” with the exact opposite of anger and wrath. They know how deceptive that path is. They know that Marketing 101 has got that path all sewn up, because the easiest way in the world to unite the people and make them feel good about themselves is to unite them against a common enemy. “Onward Christian soldiers, marching as to war” and off we go to rid the world of the latest plague of sinners that are corrupting our children, and we all feel unified and excited and pure and righteous as we march off down the road of anger and wrath all the way to bitterness and malice and death. Your ancestors ate the manna in the wilderness, says Jesus, and then they still managed to think they were doing the will of God by marching into the promised land and waging a campaign of genocide. So they died. Those who live by the sword, die by the sword. You are what you eat. Feed on bitterness and wrath, and bitterness and wrath will consume you. They fed on the bread of death, and they died. Feed on me, the bread of life, says Jesus. Feed on my ways. Feed on what you are and become what you feed on. “Be imitators of God,” says the Apostle, the God made known in Jesus, the bread of life. Feed on the bread of kindness, compassion, forgiveness and love. Of course, the way you imagine God to be is not the only thing driving this. It is also about our basic practices in dealing with our feelings and emotions and behaviours towards one another. What you feed on will consume you. We can be emotionally like a cow chewing its cud, and what ever you chew on the longest will shape you the most. When someone hurts you or offends you or makes you angry, what are you going to do with it? Well, what kind of person are you choosing to become? You can feed on the bread of anger and hurt and the desire for vengeance and payback. You can chew on those things, over and over and over, and you will become what you chew on. What you feed on will consume you, and you will eventually be consumed by bitterness and wrath and anger and wrangling and slander and malice. Or in other words, you will die. Or you can feed on the bread of kindness, compassion, forgiveness and love. You can make a conscious choice to spit out the wad of bitterness and anger, and choose to forgive, choose to love, choose to relinquish the right to retaliate. Jesus gives no guarantee that this will work for you at all in terms of changing the other person’s behaviour. They might take advantage of your graciousness and go right on hurting you. They took Jesus and tortured him to death. So he’s not promising that this will make anyone treat you better. But what he is promising is that what you feed on will consume you and become who you are. He is promising that it will change you. So in a few minutes, when we have prayed, we are going to come to this table, and here we will be asked to make a choice. The choice we make symbolically here is the choice Jesus is calling us to live out throughout the week. Before you lies the bread of death or the bread of life. The Bread of Life offers himself to you and for you, in love, in compassion, in brokenness, laying down his life for you, that you might feed on him and become a body of kindness, compassion, forgiveness and love. Therefore, choose life. The Bread of Life. And may what you feed on consume you.